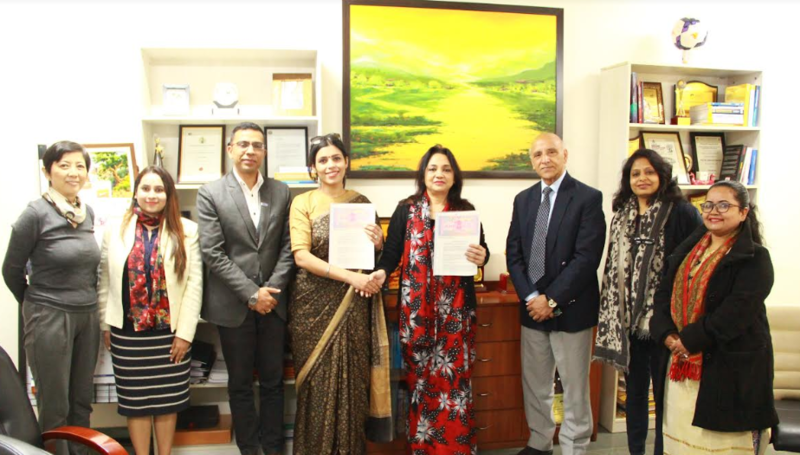 Amity University, Haryana (AUH) and NEC Technologies India (NECTI) announced today the launch of ajoint training program in Japanese language, culture and Japanese business practices for Amity University students. NEC Japanese Language Academy (NJLA), the language and intercultural training academy of NECTI, will facilitate the training program. Over 200 students are expected to be trained under this program. An MoU was signed by Mr. Piyush Sinha, Deputy Managing Director, NECTIand Prof (Dr) Padmakali Banerjee, Pro Vice Chancellor and Dean Academics, Director Amity Business School, in the presence of key officials and dignitaries such as Prof Ashok Tiku, Head, Amity School of Languages, Mrs. Reena Nigam, Head, Amity Skills Institute, Mrs. Archana Tiwary, Assistant Professor, Amity School of languages. NEC Japanese Language Academy was inaugurated in 2016 with the aim to cultivate Japanese language skills. Its main focus is tocontribute to the mutual economic growth of India and Japan by providing support for overcoming two major challenges, language and cultural barriers.